getTV is excited to now welcome guest bloggers to write about their favorite films and television shows every month! June's guest blogger is the talented Will McKinley, who writes for his own Cinematically Insane website and can be found on social media as @WillMcKinley. He is also an expert for respected entities such as NPR. In fifth grade I convinced a handful of friends to join me for a classic film sleepover. “It’ll be great!” I insisted. “We’ll stay up all night and watch movies and nobody will tell us what to do! Despite my cheerleading and a bowl of hot buttered popcorn, my friends were asleep before the first film ended. I was crushed, but soldiered on for the rest of the night, surrounded by the sleeping-bagged bodies of my unconscious classmates. Being a classic film fan can be a lonely experience. 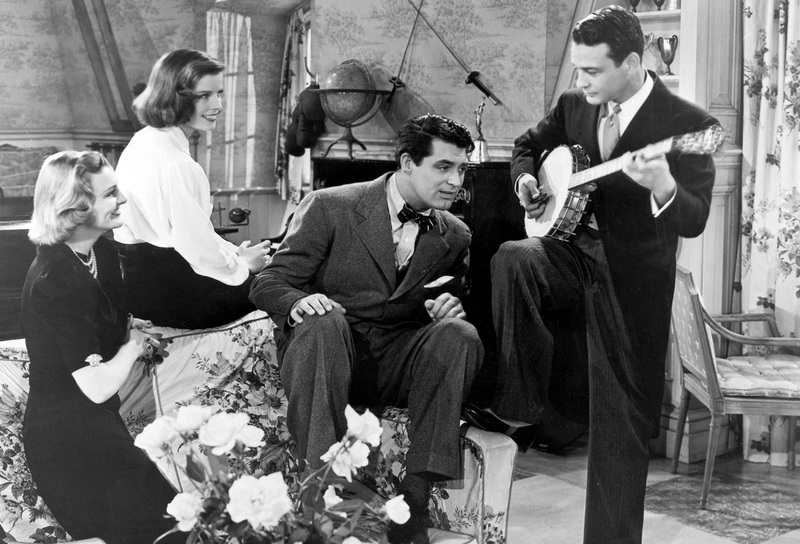 And no classic celebrates the misfit spirit of the “Old Movie Weirdo” better than George Cukor’s Holiday with Katharine Hepburn and Cary Grant. Released by Columbia Pictures in June of 1938, Holiday is a romantic dramedy with two of the most beloved icons of the Studio Era who are under the direction of a man who helped craft their screen personas. But Holiday is not just a star vehicle, it’s also a tolerance parable with a surprisingly subversive thesis. Adapted by Donald Ogden Stewart and Sidney Buchman from Philip Barry’s 1928 play, Holiday offers an indictment of patriarchy, suggests that a traditional lifestyle is not for everyone, and allows Grant and Hepburn to turn some gender stereotypes upside down. For a film made just four years after the Motion Picture Production Code took the teeth out of Hollywood, Holiday pushes its share of envelopes. Hepburn had understudied the lead role of Linda, eldest sibling of the wealthy Seton family, in the Broadway production of Holiday a decade earlier. After being labeled “box office poison” by theater owners, she reportedly paid RKO $75,000 to loan her out to Columbia for the film. Under Cukor’s direction, she delivers my favorite of her early performances as an idealistic black sheep serving out a life sentence behind gilded bars. “I’m the family problem they don’t speak about,” Linda deadpans to Johnny Case (Grant), a dreamer who proposed to her younger sister Julia (Doris Nolan) during a vacation fling. But Julia neglected to tell Johnny something that will complicate their life together: she’s rich. Only when he meets her family – including her alcoholic brother Ned (Lew Ayres) and Wall Street wizard father (Henry Kolker) – does Johnny realize that marriage to Julia will bring certain behavioral expectations. And those expectations will put the kibosh on his plan to take a “holiday” at age 30. “It’s always been my idea to make a few thousands early in the game, then quit for as long as they last, to try to find out who I am,” Johnny tells Julia’s father. It’s a brilliant strategy: engineer your own midlife crisis while you’re still young enough to enjoy it. Mr. Seton, of course, doesn’t see it that way. “There’s a strange new spirit at work in the world today, a spirit of revolt,” he harrumphs. “I don’t understand it and I don’t like it.” When it becomes clear that Julia agrees with her father, Johnny begins to doubt his own worldview. Maybe the rich people were right after all? Enter Johnny’s anti-materialist mentors Nick (Edward Everett Horton) and Susan (Jean Dixon), summoned to the Seton palace by Linda on New Year’s Eve. She’s convened a select group – dubbed the “Fifth Avenue Anti-Stuffed-Shirt and Flying Trapeze Club” – in the childhood playroom she shared with her siblings. Only in that sanctuary, awash in memories of uncomplicated youth, does Linda feel truly at home. It’s there she finds kinship with Johnny and his free-thinking compatriots, and it’s there she and Johnny share a kiss at midnight while the party to celebrate his engagement to her sister plods along three floors below. As they say on Facebook, it’s complicated. So how did a film about a guy who turns down a job and guaranteed wealth do at the box office in 1938? Ironically, it didn’t make a lot of money. Apparently a 19 percent unemployment rate rendered Holiday neither relatable nor escapist. But what may have sunk the film during the Great Depression infuses it with renewed relevance today, in an America of flextime, freelancing, and anti-Wall Street activism. To be fair, these anti-establishment themes are central to the play (Barry also went on to write The Philadelphia Story, in which Hepburn starred on Broadway) and the 1930 movie adaptation that’s best remembered for an Oscar-nominated performance by Ann Harding as Linda. But while the stagy 1930 Holiday has become a footnote, available only in a poor, public domain transfer on YouTube, the 1938 version continues to grow in stature. Much of that credit is owed to George Cukor. In a creative partnership that spanned nearly half a century, Cukor directed many of Hepburn’s most enduring films, including her first A Bill Of Divorcement in 1932. Cukor also gave Grant his first real chance at a serious character part in Sylvia Scarlett (1935), one of the three Grant/Hepburn team-ups he helmed. While The Philadelphia Story may be the best known, Holiday remains my sentimental favorite thanks to performances by Grant and Hepburn that feel fresh, unadorned, and deeply personal. But Holiday belongs to Hepburn. She navigates between petulance and pathos with a naked vulnerability that is both deeply resonant and painfully funny. That Hepburn’s Linda didn’t follow Harding’s to another Academy Award nomination is a tragedy, both for Kate and Cukor. Happily, that wrong would be redressed two years later with nominations for both for The Philadelphia Story, as well as for screenwriter Donald Ogden Stewart. Sadly, only Stewart emerged with an Oscar. Holiday airs June 7 and June 30, paired with Frank Capra’s You Can’t Take It With You, on getTV. Why not invite some eccentric friends over? I’ll bring the popcorn.